In a move motivated apparently largely by a belief that it will improve the service rather create savings, Surrey has confirmed that ten libraries will be volunteer-run by March 2013. This is the second time that Surrey has tried to implement volunteer-run libraries: its previous attempt was rejected by a judicial review. The Council simply redid the bits that the Judge said was lacking and repeated its earlier plans. The council press release boasts that “A teacher, a GP and a psychologist are among an army of volunteers who will help unleash the full potential of their local library”. Paid library staff have, it appears to be implied, somehow been holding this potential back. So, why the change? Well, “Volunteers can now take a library that is closed three days a week and open its doors daily. They can cater for the commuter rush, hold evening classes, community events or online author talks to help fulfil a library’s potential.”. However, quite apart from an apparent under-valuing of paid staff, the decision may not be quite as popular with communities than the press release implies. Surrey Libraries Action Movement, who were instrumental in bringing about the judicial review, have repeatedly asked the Council to rethink its plans. That the Council appear to have completely refused to do so suggests that the revolution in providing services may not be quite as customer-driven as described, especially as it appears that no-one in the county apart from councillors actually preferred volunteers to council-run branches in the first place. We can only hope that this is not a harbinger of the final result of the Doncaster judicial review, which had its first day in court today. It should not be as, although the Mayor there is also wanting to force libraries onto volunteer groups, he has done so directly against the majority wish of councillors. The oddity of elected mayors withstanding, that to me looks like a pretty big no-no. But with the general weirdness of politics and legislation in the UK, nothing is for certain. Cross fingers for next week when the judge reads out the decision. Petition – Against the Law Society’s attempt to sell off a unique historic collection of several thousand manuscripts, early books, and pamphlets. Date for you diary – Speak Up for Libraries conference, November 10th, CILIP HQ, near London Euston. Bookyard, a library in Ghent, Belgium – LISNews. Art piece in Belgium shelves thousands of books in a vineyard. Apparently with no protection from the rain. Watch The Library of the Future on PBS. See more from Conversations. 30 minute PBS (USA) special on the future of public libraries, including interviews with San Antonio Library and Arhus Library, Denmark via Finding Heroes. Libraries left on the shelf with 40pc less spending – Yorkshire Post. “Libraries in Yorkshire and the Humber are chronically under-funded with some councils spending more than 40 per cent less than the national average on services, it can be revealed today.”. Survey of library spending in the area, linked with the Doncaster space. “All but three of the region’s local authorities spent less than the national average of £17,106 per 1,000 people in 2010/11, figures gathered by the Yorkshire Post through a Freedom of Information request reveal. The average amount spent in the region was just £15,266.13.” Councils defend lower spending levels as “value for money”. PLR and volunteer-run libraries – Society of Authors. “Our General Secretary, Nicola Solomon, has again written to Ed Vaizey MP, Minister for Culture, Communications and Creative Industries, about PLR and volunteer-run libraries. Read our letter of 23 July.Following an article from the libraries campaign group, Friends of Gloucestershire Libraries (Is Gloucestershire County Council giving unlawful advice to Community Libraries?) which prompted the PLR Registrar to confirm that volunteer libraries outside a council’s statutory provision would not pay the PLR, Nicola Solomon sent a letter to culture minister Ed Vaizey on 17 July to raise a number of concerns.”. The response from Ed Vaizey does not answer the main points we made previously and Nicola Solomon has therefore written a reply and further request to answer our points – particularly in relation to European obligations. “The Public Lending Right (PLR) Registrar will decide after careful consideration, on a case-by-case basis, whether any particular library falls within the statutory public library service provided by Local Authorities and Councils to the public. If a library falls within the PLR scheme loans of books from those libraries will be relevant for the calculation of PLR payments to authors by the Registrar. ” Public Lending Right: How it applies – DCMS. Surrey – Bagshot, Bramley, Byfleet, Ewell Court, Lingfield, New Haw, Stoneleigh, Tattenhams, Virginia Water and Warlingham will be volunteer-run by April 2013. No savings will initially be made by transfer. Harrow – Motion on the privatisation of Harrow Library Service – Stop the Privatisation of Public Libraries. Motions presented to council on the proposed move. 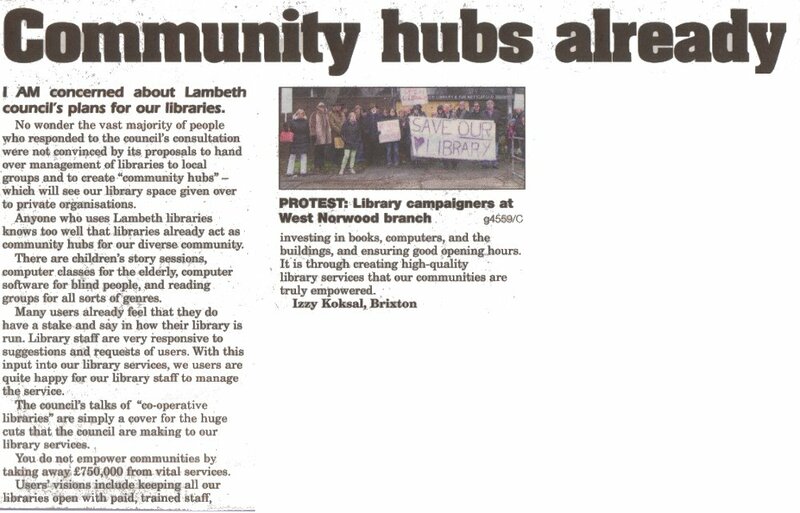 Lambeth – Community hubs already – Lambeth Save Our Services. Worry that handing over libraries to “private organisations” and argues that libraries are already real “community hubs” … “You do not empower communities by taking £750,000 away from essential services”. Print article This entry was posted by Ian Anstice on July 24, 2012 at 10:10 pm, and is filed under Uncategorized. Follow any responses to this post through RSS 2.0. You can skip to the end and leave a response. Pinging is currently not allowed.